Here at Evergreen Doodles, each of our mamas and papas belong to our Guardian Home Program. Kim's Rare Jewel: Jewel is a 65 pound golden retriever who is actually Latte's sister. In her guardian home she loves to hang out in the beautiful yard that her guardians Jeni and Mark spend hours tending to. Jeni's elderly mom lives with them and Jeni reports that Jewel is practically a therapy dog when it comes to keeping Grandma company during the day! As you can see Jewel has great eye contact and loves to entertain her family. They teach her tricks and swear that she can talk! Jewel like her sister has a smooth wonderful coat. Mercy: Annie's Mercy Grace is a beautiful F1 born here my mother-in-law's farm, but raised by a wonderful guardian family in Burlington. She weighs 55 pounds and has a typical Goldendoodle way about her- smart and good with people! She is our star for making almost perfectly non- shedding F1bs. She has a beautiful coat that includes cream, caramel, and red. Her litters usually have a spectacular array of coat types! Gabby: Annie's Gold Medal Gabby is a beautiful F1 with a gorgeous soft coat. She has the sweetest personality and a gentle spirit. Gabby was easy to train and responds well to verbal affirmation. Her intelligence is matched only by her eagerness to please! Her favorite things to do are go for walks (though she more often trots) and snuggle with her family. She weighs about 55 pounds. Apple: Annie's Apple Pie A La'Mode is our boxy blonde long haired golden retriever. She gorgeous looks are only second to her incredibly sweet temperament. Apple is a classic noble, loyal, and affectionate golden. Her facial expressions are the best! She weighs in at a stocky 60 pounds. Eadie: Eadie is our other English Cream Golden Retriever. She makes sweet tempered Teddy Bear Golden Doodles. She has honey colored eyes and great curly hair that makes for curly doodles--and tends to have low shedding puppies! Eadie was easy to train and has a great even temperament. She loves to play with her humans and making friends with other dogs. Cooper: Heidi's Super Cooper is a gorgeous and snuggly apricot standard poodle. His signature markings make for adorable golden doodles often matching his stars. Cooper lives with us in our home and his favorite things are romping around our neighbor's 100 acres, playing with our son, and trying to convince us he's still a lap dog! His eyes are a true window into his heart. He is about 45 pounds of love. Rocky Reliford's Red Rocky is our wonderful AKC mini poodle. Rocky weighs in at 7 pounds. He is a little guy, but he packs a big punch when he is AI (artificially inseminated) with one of our girls to produce F1 mini -medium Goldendoodles! He produces mellow tempered -gorgeous coated Goldendoodles. He lives in a guardian home in Bellingham where he goes to work with his master Robby, who owns a hardwood floor company. He has great manners and so adores his guardian and his family. Einstein: Appropriately named, he is very smart and the happiest dog! Not only did he pick up on his name and advanced training, he also responds to a secret whistle his family made up. He lives in California with my brother's family including two young daughters. He even responds to their commands. He weighs about 50 pounds of lean strong muscle! Vera: Vera is one of our English Cream Golden Retrievers who make some of our beautiful Teddy Bear Golden Doodles. Her boxy frame and face are ideal for Doodle puppies! She is affectionate and playful and loves going for walks. She is 55 lbs and has a beautiful golden cream colored coat. Pearl: Kim's Precious Pearl is our adventurous and free spirited golden retriever. 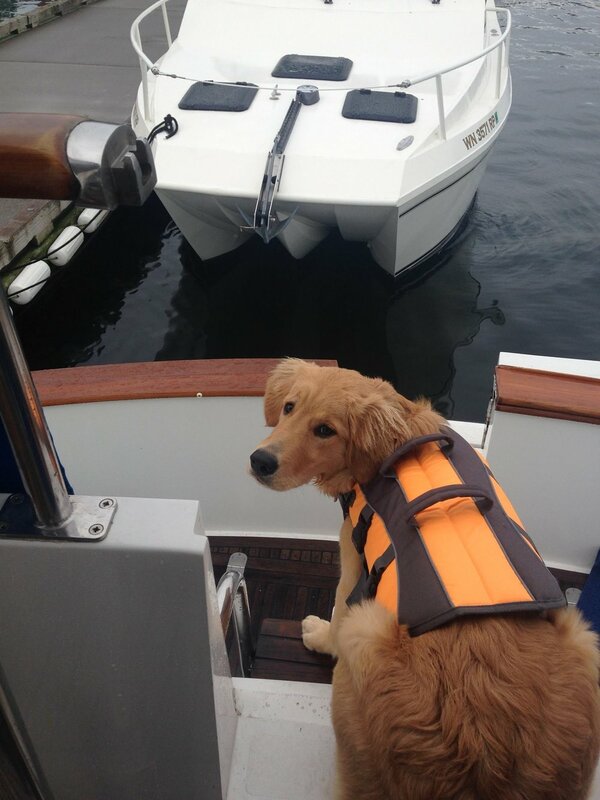 She is athletic and loves going on her guardian's boat! Pearl is affectionate and has a beautiful soft darker coat. Her athletic build makes her one of our smaller mama's at around 45-50lbs. Kim's I Need a Latte': Latte' is a 65 pound golden retriever who loves her guardian family and actually made her debut in the background of a YouTube video that went viral. Latte' has a good life filled with tea party's and 2 little girls giggles! She is gentle spirited and oh so patient with her guardian kids. Latte' has a soft beautiful coat which makes for soft F1 Goldendoodles when mixed with one of our poodles. Alex Alex's CKC (Continental Kennel Club) name is Alexander from Tyco Ranch. He is a cream standard poodle. Alex steps up to the plate to make standard F1 and F1B Goldendoodles. I have met some standard poodles that are huge and come bounding up to you, not Alex. He is a gentleman. He has a sweet, easy-going temperament. He is the perfect size for our breeding program, because we do not want to produce giant doodles. He weighs in on the smaller size for a standard poodle at 45 pounds with perfect proportions. His pups are usually 50-75 pounds as adults. Breeze: Breeze is Copperfield's Easy to Envy. She is an envy at that. She is a beautiful young lady that actually lives with one of my aunts and her family. Breeze has a wonderful spirit about her. She has very cute long ears which translates into very cute Goldendoodle ears. Breeze loves to go on walks on the trail by her house, and each time she brings back a tennis ball that she is found along the way. Patty's back yard is littered with Breeze's treasures from her walks! Breeze is a pretty short retriever and is nice and stocky at 55 pounds. CG's Panda Bear: Panda's perfect day would be snuggling up close with you and playing outside. She is the happiest dog we have ever had and instead of running, she bounds! Panda has a darker coat on her back and lighter fur underneath. She weighs about 60 pounds.